The Montecristo Open Master is a beautifully constructed cigar. The wrapper does have some very minor flaws (a watermark here or there), but otherwise has very fine veins and a velvety texture. When squeezed, the cigar has a slight give, suggesting a tight pack on the filler tobacco. After using a straight cut, I test the draw and, unsurprisingly, it’s fairly restrictive. Probably an 8/10 in terms of level of restrictiveness. The cold draw is cool and light, but with a very strong presence of almonds and fresh bread. Off of the foot of the cigar, I pick up bright aromas of cedar, salt, and some light pepper. Nothing special, but lighting up can change that in an instant. Lighting the cigar, the Montecristo Open Master opens quite mild, with flavors evenly matched between mild sweetness, bitterness, and spiciness. The first impression is almonds, light pepper, yeast, and coffee. The retrohale is where most of the flavor resides, primarily in the form of spice and toasted bread. Fairly straight forward and uneventful. The tight draw doesn’t seem to have affected the smoke production much, which is about our even a touch above average, thankfully. At an inch in, the burn is straight but the cigar doesn’t seem to want to stay fully lit for more than thirty seconds to a minute, forcing me to choose between smoking the cigar slow and getting too-little smoke, or puffing too quickly and overheating the smoke. Annoying, but the problem thankfully seems to subside by the beginning of the second third. At the beginning of the second third, the mild body of the smoke increases, bringing along with it more flavor while remaining very smooth on the palate. The primary almond note, while still present, it’s superseded by espresso and pepper, giving the experience a bit more personality. These notes are nicely balanced by a new lemon peel flavor that touches the tip of the tongue. About five minutes in to the second third, the balance and composition of flavors shifts dramatically, with a delicious sweet, almost floral cake note joining the pepper and espresso. It’s nicely balanced and has caught my attention, though the cigar has yet to reach even medium strength. 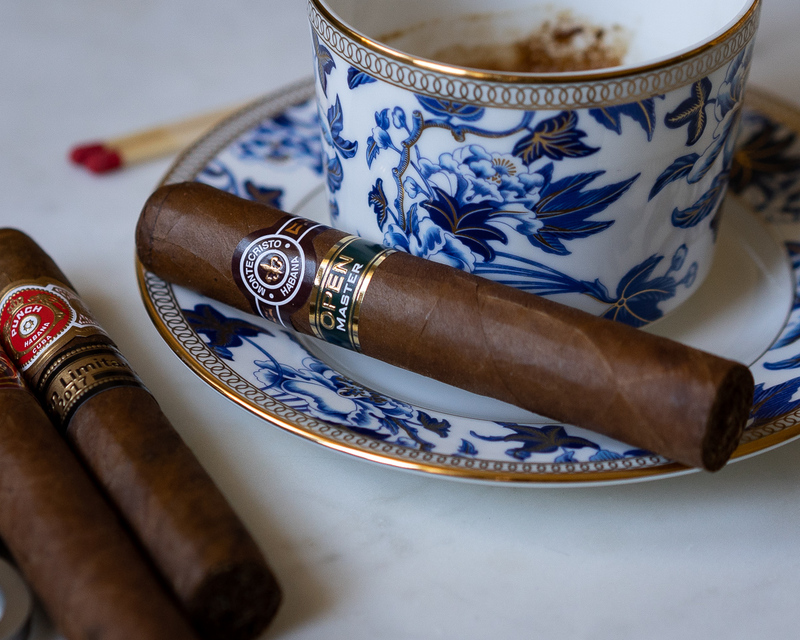 The Montecristo Open Master smokes this way until the final third, where the strength and body continue to creep up to just about medium. The espresso is now back in full force, along with strong cedar, and the pepper which was initially mild is now fully developed on the palate. There’s a bit of cream on the finish, but it isn’t quite pronounced enough to fully balance against the cedar which is a bit too bright for my tastes. Still, there are moments in the final third where the Open Master is fully balanced, and those moments are wonderful. Though by no means a perfect cigar, I really enjoyed the Montecristo Open Master. After a somewhat subdued start in the first third, it gains some wonderful notes of sweet cake, cream, espresso and wood that is nicely balanced out by cream on the finish. Construction held the experience back at times, but it’s absolutely a cigar I’ll return to given the opportunity. Overall, I think the Open Master accomplishes what Habanos set out to do, which is produce a cigar that is gentle enough for new smokers to enjoy, but complex enough for a veteran smoke to smoke in a pinch. Montecristo Open Master is available at many duty free shops or online at Montefortuna Cigars.